Run-a-Weigh portable floor scale features 24.5 x 30 platform with easy-access integral ramps, built-in handles and wheels, lightweight 95 lb frame for easy mobility and use in multiple locations. Available in mild steel deck or wash down 304-grade stainless steel smooth deck. 500 lb and 1,000 lb capacities. The Cardinal Run-a-Weigh portable floor scale features a spacious 24.5 x 30 inch (62 x 76 cm) platform with two-way, easy-access integral ramps, built-in handles and wheels, battery power option, plus a lightweight 95 lb (43 kg) frame for easy mobility and use in multiple locations. 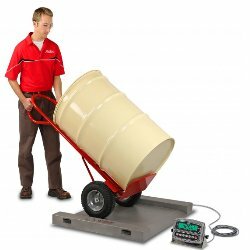 The Run-a-Weigh easily fits through standard doors and can go wherever you need it for weighing drums, barrels, industrial containers, and small crates. The ultra-low, 2.2-inch-high profile allows easy loading of heavy items. It is available in a heavy-duty checkered mild steel deck with 500 lb x 0.2 lb / 225 kg x 0.1 kg or 1,000 lb x 0.5 lb / 450 kg x 0.2 kg capacity or washdown 304-grade stainless steel smooth deck with 1,000 lb x 0.5 lb / 450 kg x 0.2 kg capacity. All components are USA-made including the scale, stainless steel load cells, and indicator.